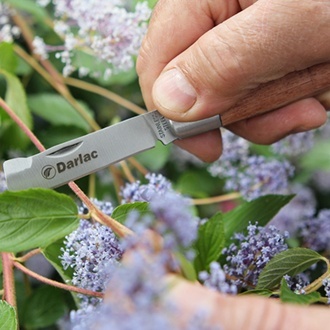 Darlac Budding Knife has stainless steel blade and wooden handle and is widely used for grafting fruit trees, roses and grapevines. Ideal for grafting fruit trees, grapevines and roses. This stainless steel blade and wooden handled Budding and Grafting knife is widely used for grafting grapevines, fruit trees and for roses. It has a slightly straight blade with a slightly sharpened bark lifter on the top edge.